Jimmy Fallon loves to play games on The Tonight Show, and this week, the late night host put together a special round of “Box of Lies,” starring Channing Tatum. Why was the round special? Because it marked the first time Fallon has played “Box of Lies” with another dude. As it turns out, Tatum is a worthy opponent. Check it out, below. The basic premise behind “Box of Lies” is that two players sit on opposite sides of a table that has been partitioned off. One player will grab a box and either choose to tell the other player the truth about what is in the box or choose to lie to them about its contents. The second contestant must then guess whether the other contestant is lying or telling the truth. It sounds complex, but it is actually pretty easy. In this week’s round of “Box of Lies,” Channing Tatum and Jimmy Fallon are given a variety of strange objects to discuss. The first is Han solo in some frozen gelatin, which Tatum lies about. Fallon lies for his round, too. Then, an E.T. stuffed animal hiding out in a miniature sleeping bag covered with crowns propels Channing Tatum to the win, after he tells the truth and Jimmy Fallon chooses to disbelieve him. Seriously, it must be one of the greatest gigs ever for The Tonight Show support staff to run around and find the most random objects ever to fill the boxes for the “Box of Lies” sketch. The end result is an incredibly fun sketch that is worth repeating. 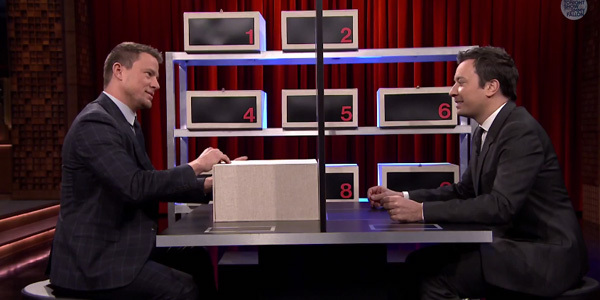 While Channing Tatum is clearly the master of “Box of Lies,” Fallon is no slouch, either. Previously, the late night host defeated Emma Stone at the game. As Tatum proves, Fallon doesn’t always win at his own games (although it should be noted he also lost to Tina Fey in the past). As if “Box of Lies” isn’t enough fun for the day, recently, the man’s played several other games with big name celebrities, including a game of “Pyramid” featuring Jeff Daniels, Usher and Nick Jonas and an awesome “Wheel of Musical Impressions” game with Adam Levine. The late night host is on a roll and you can catch him on NBC weeknights at 11:35 p.m. ET.